Oh, sorry. We’ve been stuffing ourselves to the gills around every corner of Greater Lowell to bring you HOWL’s second annual food and drink issue. Food has always been the great social connector, bringing friends old and new ‘round a table for sharing conversation and making memories. Because good eating is also a gateway to new experiences, we thought we’d kick off this decadent edition by taking you on a trip around the world, one plate at a time. After a long day at work, nothing beats bellying up to Cobblestones for creative culinary offerings like spicy Portuguese mussels with chorizo, acorn squash with sweet cotija corn, poblano, golden cauliflower and spiced honey, or a super refreshing grilled watermelon salad. Service never disappoints and we love the restaurant’s many spaces in one from the outdoor patio and relaxed bar area to the modern and airy dining room. Two upper floors have plenty of character for private functions. But once you dig into the food, you’ll be pining for one of the many seasonal craft beers on tap. Get your hands dirty and get ready for some unbutton-the-pants gusto at Lester’s Roadside BBQ where the ribs are slowly pit smoked for authentic southern flavor and served up with collard greens, corn bread and sweet tea. Take slow roasted meats or cold cuts, add plenty of crisp fresh vegetables like cucumber, cilantro, pickled carrots and chili peppers, pack it all neatly into a house-baked baguette swiped with a tangy buttery sweet spread and you’ve got a bonafide bahn mi — a Vietnamese sandwich that is a thing of wonder. Nobody does these babies better than Hong Cuc Deli. The barbecue beef bahn mi is a favorite and sells out quick. They’ve got a great selection of bubble tea too. The family owned and operated Olympos Bakery hand forges heavenly breads like Vienna, seeded buttery knots, French sticks and many more artisanal loaves that are the perfect compliment to the shops handmade subs, paninis and sandwiches. They also make their own pizza sold by the slice and have a dessert case that will make you cry tears of joy and happily loosen your belt in defeat. Try their cannoli. Whether you follow the craft cocktail scene or just like sharing a few laughs with friends over a well-built drink, Sheryl Rossano-Rasmussen is the gal behind the bar who can take the edge off the end of the day with a vigorous shake, a few flicks of the wrist and some comfort in a glass made just for you. More than a mixologist, she also plays the part of psychologist, snack replenisher and friend. Friends is a cozy spot that’s big on flavor with lovingly prepared Portuguese classics like chourico sausage and bacalhau (codfish drizzled with olive oil and lemon), but the quaint outdoor patio feels like hanging out in a friend’s backyard and is the perfect place for sipping the restaurant’s decadent Espresso martini. 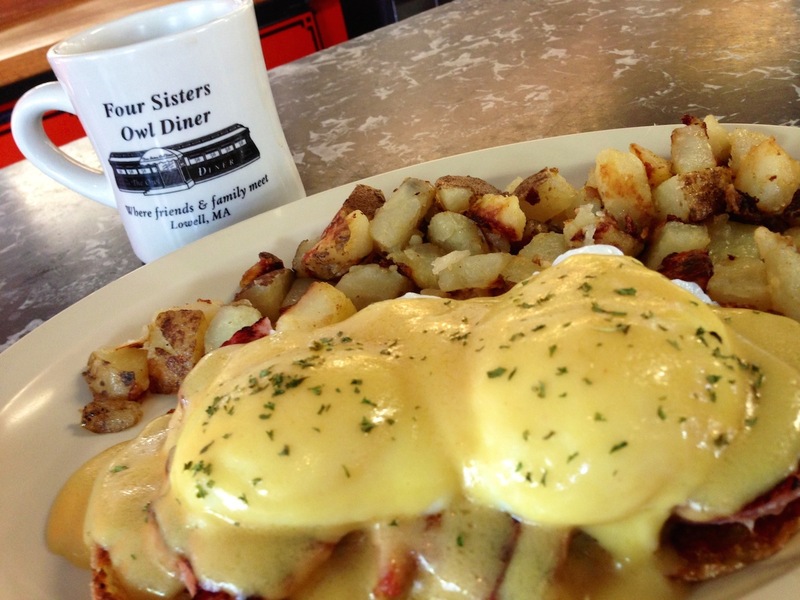 For fluffy omelets, plate-sized pancakes and cuts of ham two-fingers thick, you can’t beat Four Sisters Owl Diner for a hearty, stick to your ribs New England breakfast. Owl Diner photo by Jen Myers. Consistently our Holy Grail go-to for cheeseburgers, Thirsty First’s signature Ward Eight burger is a thick and juicy patty seasoned to perfection and topped with cider bacon, caramelized onions, and a blue cheese melted in with a cheddar cream ale sauce. Simply, it is heaven on a bun. Please note that the former Ward Eight tavern has new owners, and is now Thirsty First, but the famous Ward Eight burger remains on the menu! A place for the food adventurous — including Travel Channel host and food connoisseur Andrew Zimmern who featured Simply Khmer on his popular TV show Bizarre Foods — here you can chow down on expertly cooked and seasoned bull frog legs or alligator. But for those who want to keep it a little less bizarre, you absolutely can’t go wrong with authentic Cambodian dishes like Amok Trey, curried boneless Talapia fish steeped in a flavorful coconut sauce with kaffir lime leaves, lemongrass, shallots and served up in banana leaves; or the original Khmer Loc Lac, beef sautéed in a savory lime and pepper sauce and served over a bed of fresh greens, tomatoes and cucumbers. People come from far and wide to Delicias Paisas, an unassuming Colombian grill on traffic-clogged Bridge Street, for the succulent meats, rich Colombian coffee and tasty empanadas (seasoned beef or chicken turnover). But the traditional bandeja (country mountain dish) is a thing to behold, stacked high with steak, pork, sausage, plantains, beans and rice all topped with a fried egg and served with a side salad (hey how in the heck did that get there). You’re looking at two meals rolled into one for about $13. The flan is also swoon-worthy. Delicias Paisas photo by Tory Germann. Besides downing fair trade coffee in the form of cappuccinos, lattes or just straight up black, the clientele at Brew’d Awakening is fiercely loyal and always expanding. It’s easy to say it’s the best place to be seen in the city, with people of all walks coming into get their caffeine fix, play (there’s live music every Saturday and open mics on the first and third Tuesdays) and work thanks to the free wifi. Outdoor seating offers extra room and interesting people watching in good weather. Revenge on your diet never tasted so sweet. Little Delights proves good things come in small packages with creative cupcake recipes like the rum spiked dirty tiramisu, the decadently rich death by chocolate, and plenty of other sweet options topped with cloud-like fluffs of buttercream icing. Be sure to inquire about their amazing custom cakes for special occasions too. Take a break from the rush of the city and recharge the senses and your palate at Nashoba Valley Winery. The sweeping orchard views from J’s Restaurant are beautiful year-round and appetizers like the cheese plate, three local cheeses served with clover honey, toasted Marcona almons, dried fruit and a grilled baguette, and main courses like free range chicken with roasted foraged mushrooms or citrus marinated grilled tofu, pair perfectly with the variety of wines made on site. Sunday brunches here are also well worth the trip. Want to find all your produce needs in one place? Mann Orchards has got you covered. This Methuen institution is stocked to the rafters will fresh produce from several local farms, including their own, giving you endless options for dinner. 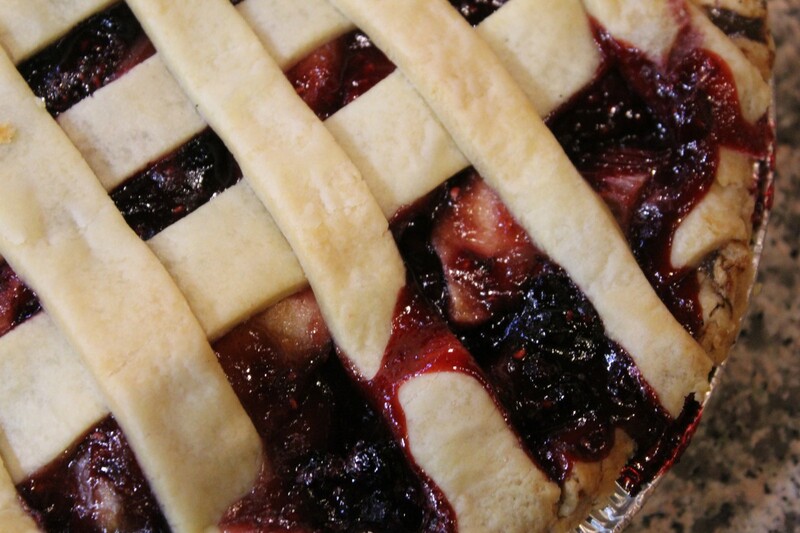 Besides a cornucopia of fruits and veggies, the farmstand serves homemade, country-style lunches and heavenly pies. The apple is a surefire crowd pleaser. Monster-thick and crammed full of tender slices from the orchard, the sticky affair is swoon worthy. Mann Orchards pie photo by Erika Weiser. Inside a converted train depot, chef Carolyn Johnson and the creative team behind 80 Thoreau work their magic on an amazing menu executed to perfection from the melt-in-your-mouth seared duck prepared with chestnuts and pears to the silky lobster cavatelli with pumpkin, sage and roe butter. Cocktails mixed at the lively bar are also show stoppers including the Pushing Daisies with Boston rum, Cynar, lemon and ginger, and the Hedgerow Twist with strawberry shrub, gin, Aperol and Lillet. If you’re going to spend your paycheck on dinner, this is the place to do it. 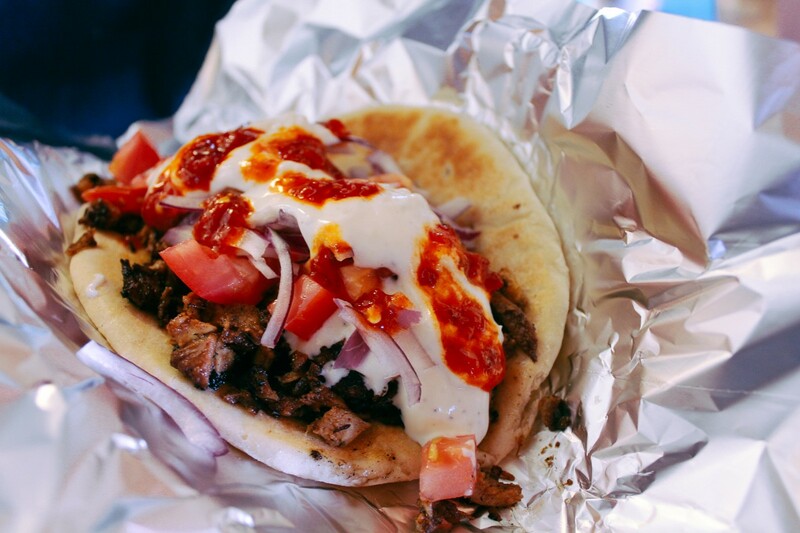 The belly dancing and live Greek band Markos Mediterranean Grill has a gyro stuffed with perfectly seasoned and marinated meat, and drizzled with a housemade tzatziki, that has yet to be rivaled. Everything on the menu is under $10 and the oversized vegetarian falafel can’t be beat. Markos photo by Nancy Ho. The belly dancing and live Greek band ought to tip you off: The Athenian Corner is one of the more authentic dining experiences you’ll find in the city. For 40 years now, this family owned and operated downtown staple still doles out some of the region’s freshest dishes off a menu packed with everything from crisp calamari and succulent grilled seafood to melt-in-your-mouth kebabs served over colorful veggies drizzled in olive oil and feta. With a front entrance located off the main road along a stone cobbled alley, it’s easy to miss Tutto Bene Wine & Cheese Cellar. But the tucked-away location is also part of its charm. Behind busy Prescott street, a flower adorned terrace with leafy window boxes lend to an old world charm with all the flavor of Italy. Inside, a well-stocked selection of wines from around the world awaits. There are plenty of options for every budget and the shop’s passionate owner, Ellen Andre, is happy to help find the perfect bottle. The store also stocks gourmet cheeses, chocolates, artisan pastas, breads, sauces and meats. Devotees of steaming table staples such as chicken tikka masala and slow-cooked tandoori meats will fall in love with Priya, a no-frills restaurant located in a strip mall where all the oomph is saved for food punched up with exotic flavor. The Hindu doctrine prescribes six rasas (tastes) — sweet, sour, salty, bitter, pungent and astringent — to balance your diet and, perhaps, your life. Priya’s stellar lunch buffet, overflowing with 22 North and South Indian standards like creamy saag paneer and Gobi masala (cauliflower and peas), allows you to sample as much as your belly can handle for $10. A throwback to authentic trattorias from the old country, Filho’s Cucina is cooking in its purest form. Like a bare-faced Audrey Hepburn, The Linguine de Cucina is a thing of beauty, made simply from quality, fresh ingredients like basil, parsley and cracked black pepper that is sautéed in garlic oil, simmered in marinara and tossed with romano cheese and linguine. Seating is limited in this small and casual café and the restaurant’s fan base constantly clamoring for these rustic dishes can even make take-out a challenge on busy nights —and it gets very busy. So if you’re planning on dining in or getting your order to go, calling ahead is wise. The restaurant has a BYOB permit and with the Groton Market located right next door, you’ll have no trouble finding a wine to match your meal. Filho’s Cucina photos by Nancy Ho. There’s something to be said about any eatery that only needs to open three days a week to thrive. Fans of the landmark Tony & Ann’s Pizza — including Simpson’s designer and Chelmsford native Lance Wilder who had his freezer stockpiled with the pies in L.A. — were crushed when the business closed its doors in 2002. Family members revived founder Tony Privitera’s secret recipe and reopened the shop in 2010. Loyal customers still flock from miles away for a taste of their childhood favorite on Thursdays, Fridays and Saturdays. Located in Lowell’s Back Central neighborhood, Cavaleiro’s serves up steak like nobody else. An 8 oz. filet mignon arrives at your table, sputtering and popping on a seasoned hot stone, ready to be cooked by you — just the way you like it. While searing the melt-in-your-mouth meat to perfection, try their award-winning sangria, laced with cinnamon for an extra special kick. Cavaleiro’s photo by Tory Germann. Fishbones photo by Nancy Ho. You’ll find premium fresh catches beautifully prepared at Fishbones, along with platters of iced, just-shucked sweet oysters, delicately fried clams and lobster served every which way including the outstanding lobster roll — stuffed with sweet, lemony meat on a butter-enriched bun — a crowd favorite. Nothing beats the nostalgic combo of melted marshmallow and chocolate sandwiched between graham crackers — unless you add in even more yummy goodness like toasted coconut, caramel, fresh raspberries and peanut butter. Sweet Lydia’s puts a new twist on an old campfire favorite with gourmet s’mores made from real marshmallow. Her handemade candy bars like peanut butter and jelly wrapped in chocolate, minty patty and chocolate covered maple bacon caramels are all swoon-worthy. A transcendent bite of top-grade sushi is priceless. But at Blue Taleh, that melt-in-your-mouth morsel comes at a cost you can afford — with tip and sake included. This raw bar rolls out a no-nonsense menu of daily market finds like rosy tuna, salmon, buttery crab and shiso-and-salt seasoned red snapper, all transformed into artful, picture-perfect offerings. The knockouts are the Wrecking Ball appetizer, succulent lobster in avocado salad topped with fall-apart hunks of lightly torched salmon, taro crunch and eel sauce; and the Sushi and Sashimi boat that’s perfect for sharing. The dining room overlooks downtown’s Eastern canal and the L-shaped bar hosts original live music every Wednesday, Friday and Saturday night. Blue Taleh photo by Nancy Ho. El Potro photo by Nancy Ho. The bright and festive interior of El Potro is both laid-back and casual — a perfect setting for some of the best authentic Mexican dishes around. The mole and creamy tomatillo sauces are clearly rendered with love and skilled hands. We love the sweet, soft-braised steak tacos, fresh guacamole and giant burritos stuffed with expertly grilled meats, seasoned beans, rice and pico-de gallo-drenched wonders. Throw in the bar’s crazy tequila selection (around 30 different kinds) and the house Mariachi band, and you’ve got a prime spot for low-key, high quality Mexican. Moonstones is Cobblestones saucy sister restaurant boasting a creative cocktail menu, amazing raw bar, and a variety of small wonders proving bigger isn’t always better. Tapas plates guaranteed to kick-start the tastebuds include zesty bites like Szechuan eggplant and tofu, buffalo calamari, flaming chourico bombeiro and hoisin duck sliders. The Sunday brunch menu is also epic with options like red velvet pancakes, grilled sugar pineapple and eggs benedict served with crispy prosciutto and lobster hollandaise. Well seasoned and delicious, dishes at Viet Thai are always exceptionally fresh and clean tasting to boot. Shrimp on sugarcane and the perfectly fried calamari or fried tofu are all good bets for starters. Really, there are too many highlights on this menu to mention them all, but the crispy spring rolls with fresh mint is a surefire winner, as well as the barbecued sliced beef with sesame seasoning, which is as tender as can be. The restaurant’s signature pho is also hands-down some of the best we’ve ever had. Viet Thai photo by Nancy Ho. Life Alive photo by Nancy Ho. Life Alive whips up homestyle hippie-cooking that’s so delicious even carnivores will leave feeling full and satisfied. Dishes with names like The Rebel, The Goddess and The Hot & Healthy Bachelor are packed with fresh steamed veggies and to-die-for sauces guaranteed to make a belly happy. Thanks to a stellar wine selection and the outstanding customer service from bartender Dennis Meadows, Ricardo’s Trattoria is a standout spot to swirl, sip and savor. The intimate bar, which hosts live jazz every Thursday, Friday and Saturday, sheds the pretentious “wine-bar” stigma with a passionate wait staff and selections carefully chosen for their history, aesthetics and above all — drinkability. Read about our cover chef, Mark Conway of Kitchen Ink, here.